Pat Quinn Campaign Not Using 'Burner Phones' for Phonebanking? Yesterday, we posted this curious image that the Pat Quinn for Illinois campaign dropped on their Facebook wall that showed the campaign boasting of their 'newest batch' of burner phones. 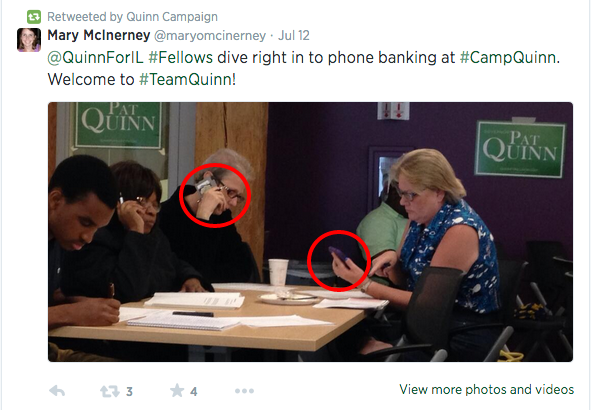 Well, a sharp-eyed reader sent us in this screengrab of a Tweet that was included in the @QuinnforIL posted by his field director handle that clearly shows these organizers making calls, but using what appears to be their own phones? If the Quinn campaign isn't using the 'burner phones' for phone banking, what else could they be used for? They appear to not be smart phones, right? Ideas?